There are some things that I’m not crazy about when it comes to big city living. You know, the parking meters that cost $3/hour. Or the restaurants that think they can charge $14 for a basic salad and $7 for a pint of Miller Lite. Or how you have to convince yourself to wait for a bus in the freezing cold for 30 minutes because driving and parking at your destination would clean out your checking account. If you haven’t noticed a theme, Chicago is expensive. I know, I know, duhhh. But the fact of the matter is, I love this city. I love the people, and the sights and the atmosphere- even when it’s so cold out you can feel your facial muscles seizing up the second you step outside. There’s a reason why Botox is more popular in sunny LA. 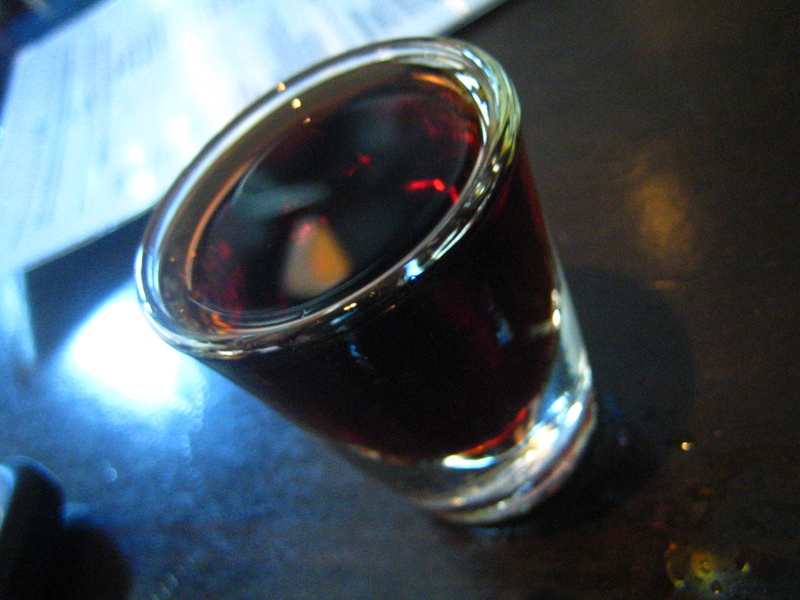 Yes, that’s a shot of Jager. No, I’m not so blind as to think that Jager is exclusive to city living. The reason this was a Chicago thing is because of who bought it. I don’t know if you’ve heard of him, he’s just a little known hockey player named Patrick Kane. Yeah, you know. Him. Only the golden boy of the Blackhawks (well, along with Jonathan Toews and Patrick Sharp). Here’s the story: whilst on a Sunday Funday bar crawl through my neighborhood (you know how I do) yesterday, my friends and I happened into Benchmark for a drink. Our server took a little longer to arrive at our table than is normal, but when she finally did come over she very apologetically explained that someone had bought a shot for everyone and it was slowing down the bar temporarily. Silly me! When she said he bought everyone a shot I didn’t realize that she meant he bought everyone at the bar a shot. And that “someone” was Mr. Kane himself. After a little speech over the loudspeaker during which he expounded on his love for Chicago and its inhabitants, our server came back to take our drink order. She also let it slip how much that round of shots set him back. Oh, just $500. At a discounted rate. So…thanks, Pat! It hit the spot! In other words, it was an awesome Sunday Funday. Also notable, look at the flowers my parents gave me for Valentine’s Day! Do I have the best parents or what?? I didn’t know you ended up at Benchmark? My friend works there- it’s a cool spot! 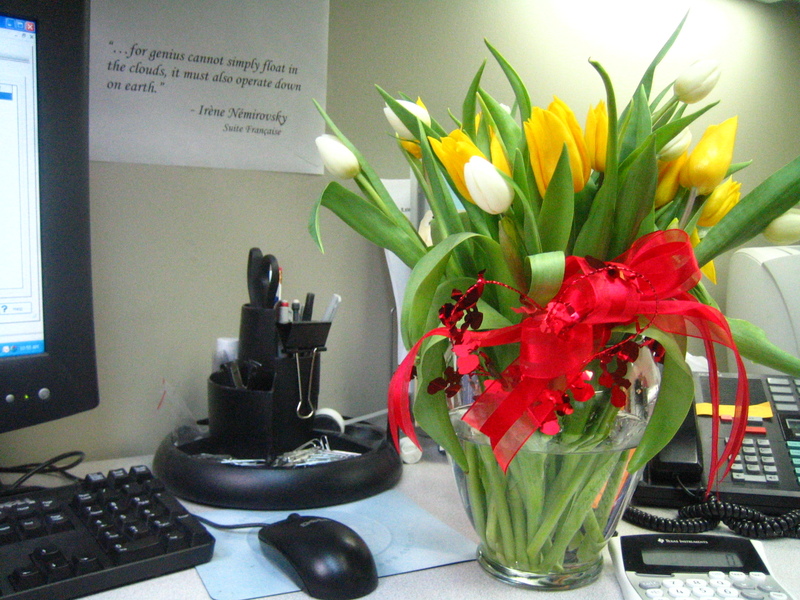 OOo I got tulips for Vday as well. And I LOVE Chicago. It’s the only city in the Midwest I’d move (back) to. Love love love. Hahaha, that’s awesome! It’s insane how quick city living adds up, isn’t it? !